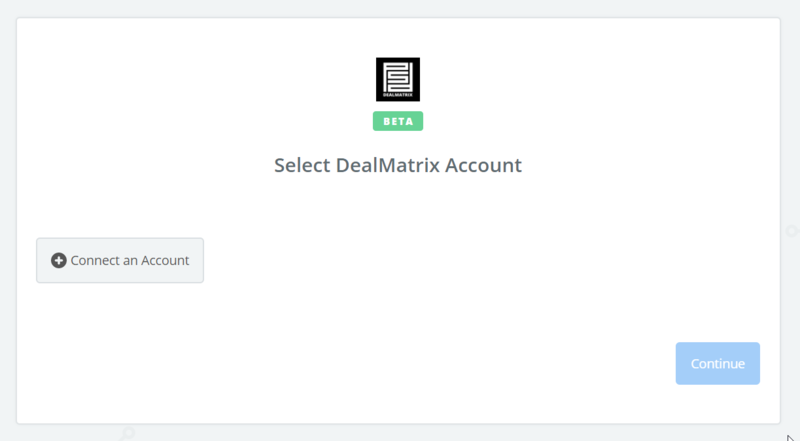 In order to use the DealMatrix APIs you require the API Add-On. Contact us to purchase this add-on and receive your API key. An API key is always associated with one particular batch. Once connected you can now create a Zap with your API key as follows. Important: These triggers are push triggers. 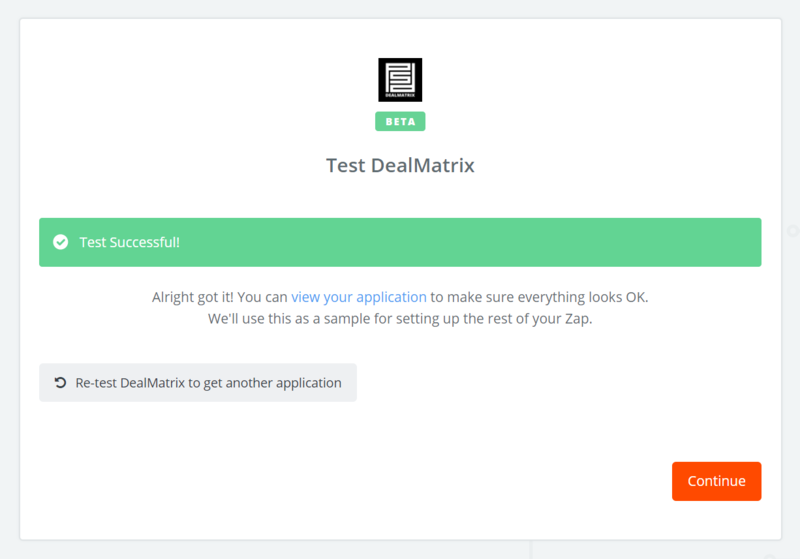 This means they will only be triggered when the Zap is active and you perform the action in DealMatrix. These triggers will not run for existing application in your portal. 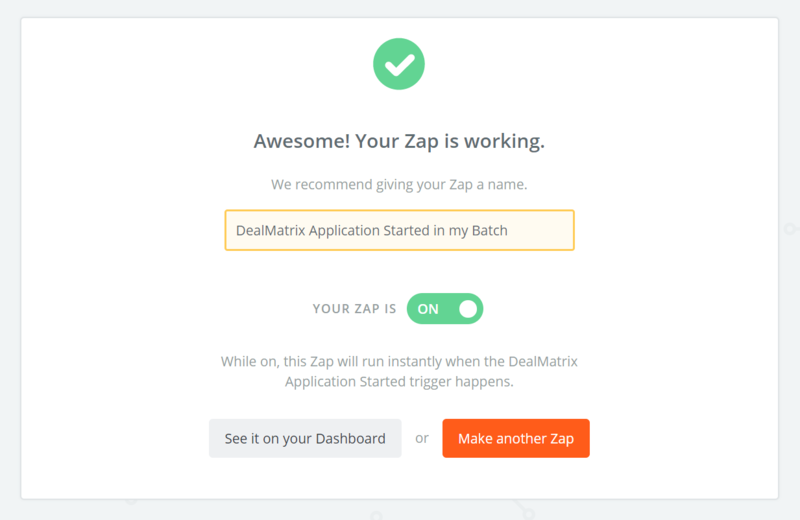 Log-in to your Zapier account and begin by clicking "Make a Zap". 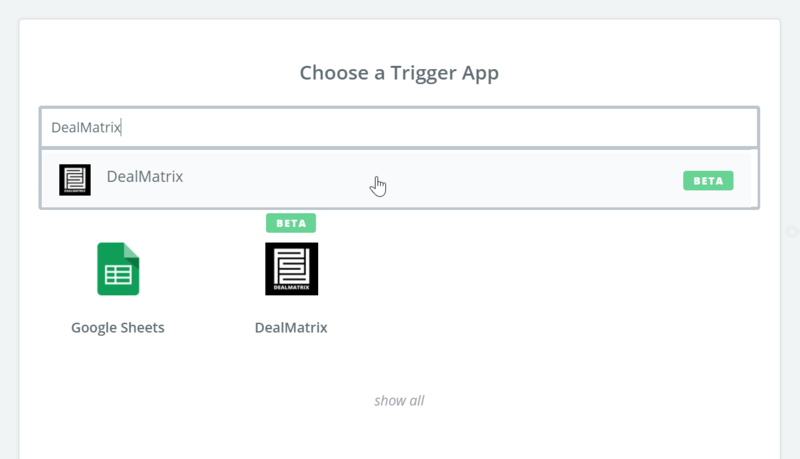 For your trigger app search for DealMatrix and press click on the search result. 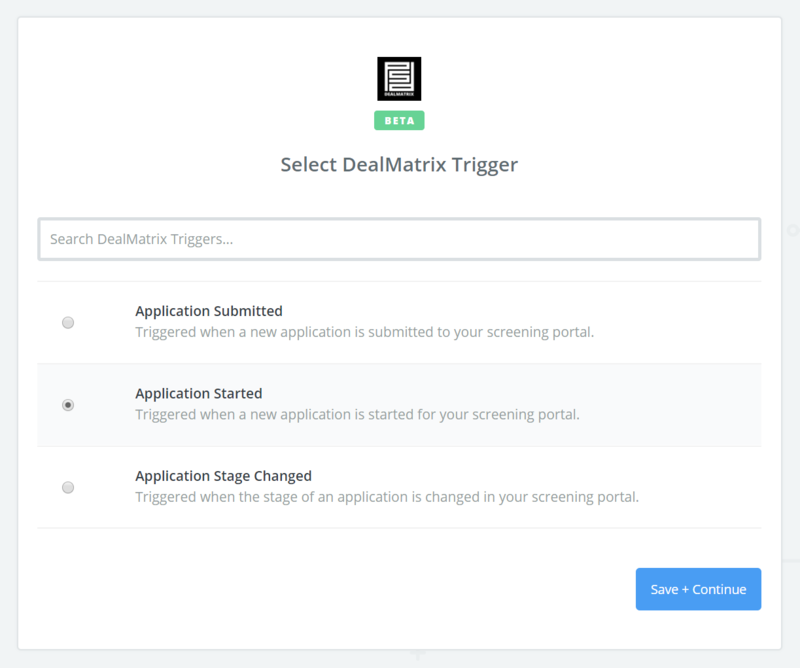 DealMatrix provides three trigger for you to choose from. The trigger "Application Started" occurs as soon as someone clicks "Apply Now" on your application form and includes the email address of the corresponding user. The trigger "Application Submitted" occurs when the "Submit Application" button is clicked on your application form and includes core data such as country, market segment, industries and others if they are asked in your application form. Please note: the trigger "Application Stage Changed" has been removed in newer versions. 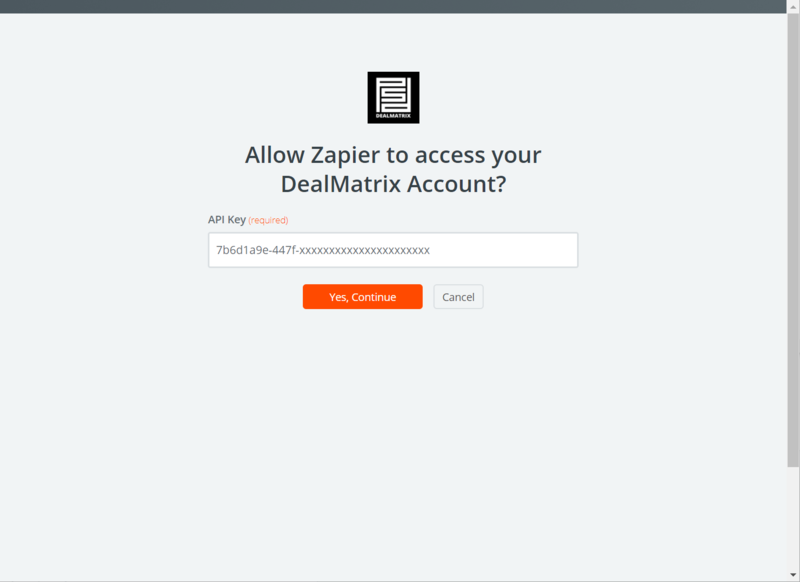 Next, click on "Connect an Account" to establish a relationship between Zapier and DealMatrix. In the next form enter your API key and press "Yes, Continue". Check that the account created is connected with the correct batch name. Press "Save + Continue". 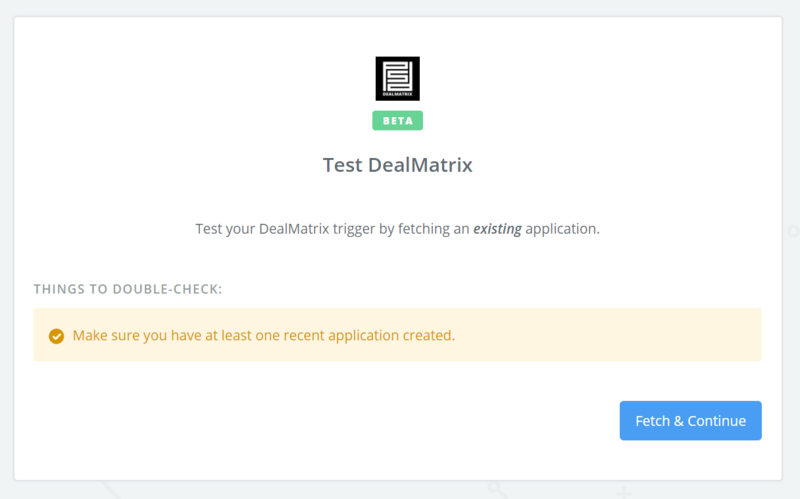 Next you will test the connection to DealMatrix. Click on "Fetch & Continue". Once the test completes successfully you can press "Continue". 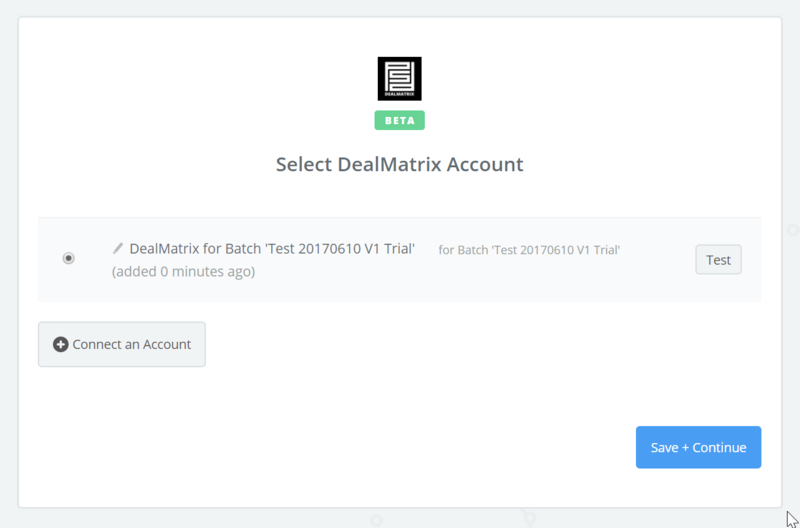 Please note: DealMatrix only supplies test data in this step, not real data from your batch. This may cause issues when testing with some other connectors (e.g. MailChimp will not accept a test run with test@example.org). In this case you can just skip the test and the real data will work as expected. 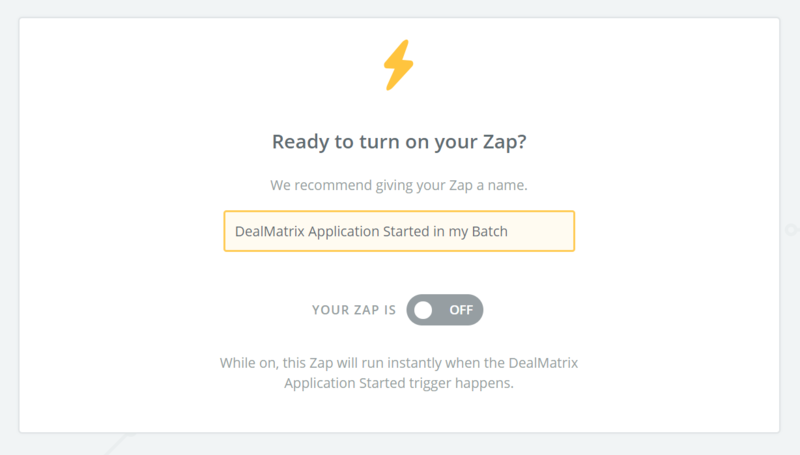 Next you create your second Zap step based on your requirements. Once the Zap is completed you can set a name. Next, you switch on your Zap. If the connection is successfully established your Zap is ready to go.